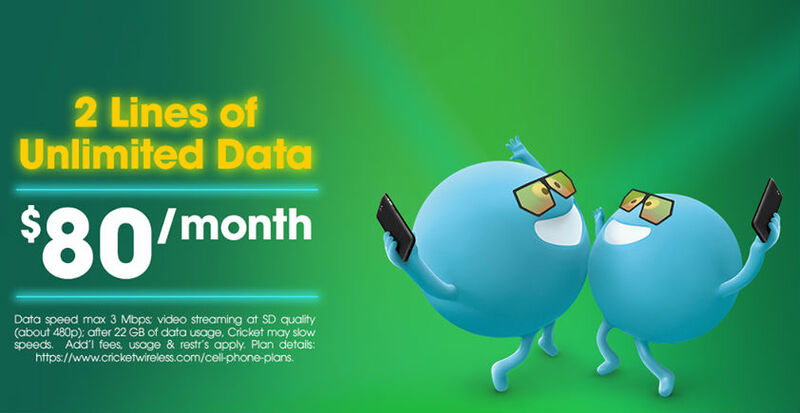 The $30/month unlimited talk, messaging and data plan will get 2 GB instead of 1 GB of high speed data per month. The $55 Unlimited 2 plan and 2 for $80/mo Unlimited promotion are returning for a "limited time". As before, Unlimited 2 includes unlimited talk, messaging and "high speed" data that's throttled to 3 mbps (with other Cricket plans, "high speed" data is 8 mbps). Video is further throttled to "SD quality (about 480p) and data is subject to deprioritization after 22 GB. Additional lines of Unlimited 2 are available at $25 each for lines 2 through 5. That means that two lines of Unlimited 2 are $80, which Cricket is advertising as 2 for $80/mo Unlimited. Unlimited 2 is not eligible for Cricket's regular Group Save discounts which are expected to change for the worse on Nov 5. It's not eligible for the $5/mo auto pay credit either. Update 11/5: Cricket's website now says that Unlimited 2 is eligible for the auto pay discount after all. Unlimited 2 is eligible for the $10 hotspot add-on which provides unlimited hotspot with the first 8 GB at 3 mbps. Today's announcement also leaves the future of Cricket's $50/month 8 GB plan very much in doubt. The elimination of that plan was part of the same rumor that correctly predicted the $30 and $40 plan data increases, the return of Unlimited 2 and the worsening of the Group save discount. There's no mention of the $50 plan in the announcement, but mobile operators usually only announce positive changes in advance. The $50 plan is Cricket's least expensive plan that includes unlimited Canadian and Mexican calling, texting and roaming and also the least expensive plan that's eligible for the $10/month hotspot add-on. I suspect that it's Cricket's most popular plan. Eliminating it would force new customers who want Canada, Mexico calling or roaming or hotspot to choose the $55 plan, or even the $60 plan if they also want 8 mbps data. If the $50 plan is eliminated, current customers on that plan will likely be grandfathered and be able to keep the plan. Update, 3 PM PT, 11/3: John from YouTube channel Magic Tech Review, just sent me a new screencap from Cricket's Hoopla intranet informing dealers that the $50 8 GB plan will not be available to new users starting Nov 5. Cricket's legacy $60 12 GB plan is also being grandfathered Nov 5. The $55 and $60 plans include unlimited Mexican and Canadian, talk, messaging and roaming and are the only current plans eligible for the $10 8 GB hotspot add on. The $40 plan is now eligible for all international calling add ons, none of which include international roaming. AT&T postpaid charges $60 plus the usual postpaid taxes and fees for data at 3mbps. If you want full speed data on AT&T postpaid it'll cost you $90. Even Verizon postpaid and prepaid offers full speed data for less at $80. With all that in mind its no surprise that Cricket drop the speed on their unlimited plan. The real question is how long the 8mbps unlimited plan will be around. MetroPCS has faster data, better promotions and free roaming on AT&T. Which means anywhere Cricket has coverage MetroPCS can roam. Any coverage gaps in the MetroPCS/T-Mobile network are covered by AT&T roaming. What's the point of choosing Cricket? Metro pcs does not offer data domestic roaming, only text and talk. Cricket has data coverage in more rural areas. MetroPCS has better voice/sms coverage when you add roaming on AT&T and regional carriers. There are quite a few places in Western states where AT&T is still on HSPA/+ and T-Mobile has LTE. You can overlay 2-4 networks' coverage using the Coverage? app, which is popular with RV owners. "Which means anywhere Cricket has coverage MetroPCS can roam"
That's misleading. The only roaming Metro has onto AT&T is text and voice. It does NOT include data. "What's the point of choosing Cricket?" People might choose Cricket over MetroPCS if they want to use data in most of the US, instead of just half. They might choose MetroPCS over Cricket if they don't need a service with reliable data. That's the way it is now. T-Mobile says it will blanket the nation with data coverage by 2 years from now, which means that MetroPCS will have great data coverage. But that is then, not now. And many of the T-Mobile prepaid MVNO subscribers have no roaming. They don't need it, so they don't pay extra for coverage they won't use. The idea that everybody should pick a carrier based on the total square miles covered on its nationwide map is silly. People aren't that stupid. If you have to go everywhere in the US, NO land-based carrier will always have coverage (buy a satcom device and service). "And many of the T-Mobile prepaid MVNO subscribers have no roaming. They don't need it, so they don't pay extra for coverage they won't use." Or they are suffering with poor coverage in order to save money. Most people do pick a carrier based on nationwide coverage because they aren't stupid. They choose such a carrier based on coverage because they actually NEED the coverage. The proportion of Americans that never leave their homes is really rather small. For the rest... for typical Americans a good network that covers almost all the nation fits the bill. Most real people prefer T-Mobile's prepaid brands and MVNOs over AT&Ts. They got the coverage they need; a very small percentage of them switch. Why stop at nationwide coverage? What about worldwide coverage? Who offers that? Total T-Mobile customers: 70 million. "What about worldwide coverage? Who offers that?" Less than 5% travel overseas, compared to the overwhelming majority of Americans to travel to other states. At this time, Americans need good nationwide service that works when they travel in the US. The need for this worldwide does exist, but it is rather small at this time in history. Let me get this clear. The $40 plan with 5GB with auto pay gets reduced to $35? Also Boost has the 5 lines with unlimited data for $100. Cricket is $55 more!! What the heck is going on with Cricket? You won't be able to come up with even one freeloader ... It's impossible, in fact. All Cricket plans are paid. Cricket should change their name to Germ Wireless to match the new mascot. Apparently the old mascot was too buggy, just like their proxy servers. 3mbit speedcap, oh lord. This is the kind of anti-consumer non-sense that should be rejected by consumers. Anyone that supports Net Neutrality should be against arbitrary caps. This is pathway to up-charge for "HD" video like the big carriers. Soon enough, its "social media" and "messaging" packs. I bet they got plans to offer premium DirectTVNow add-ons. They already charge for $10 extra for tethering. Cricket is the worst of AT&T under a budget brand. Don't reward these scumbags. Anyone who supports net neutrality? I do, but it is pointless. That ship has sailed. It's like supporting the gold standard, or the prohibition amendment. 3mbit speedcap is not all bad, heck .. it's like 5G in Sprint land. Saw this and ran Speedtest. 44Mbps on my Android at home. Last week my wife’s iPhone 6s hit 63 and 83 Mbps at our daughter’s house. On Sprint. Cricket lemmings can only dream of speeds that fast. Sorry, the networks can't handle the hoards of people watching hours per day of HD video with their unlimited data plans. The networks also cannot handle people using mobile data for as a replacement for wired internet. Network infrastructure costs money to upgrade to meet the constantly escalating demand. If you want to hog it, expect to pay more money for the privilege. Life owes you nothing. I doubt you'd feel the same way if Cricket started charging extra to visit your favorite websites. When you're paying money, you have the power to control the terms. It's really ignorant to suggest we all just roll over and accept it. The networks will support whatever consumers demand. If you demand less, you get less. For some reason Cricket customers love getting less. These are not acceptable trade-offs. These new data allowance take effect immediately or at the next cycle renewal? Regarding the 44Mps, I rather be throttled at 3Mps and have be able to use the internet and talk on the phone at the same time. What good is the high speed if you cannot consistently get it on the road. You are a cricket man. Talk and surf slowly on the road. Please don’t kill anybody. Takes effect Nov 5th but data increase will show on your next billing cycle. How convenient. Bills cycles here on the 4th. Hotspot Fee: Smart plan users can pay $10/month to enable hotspot on iPhones and a limited number of Cricket branded Android phones. Hotspot is blocked on other plans and devices although workarounds exist for many non-Cricket devices. Device Upgrade Fee: in-store $25, no fee online. They say they offer a "Premium Experience." What they mean is that you will pay a premium almost every time you need a change. Wake up the guy who always posts that only deadbeats pay Cricket junk fees. I think you'd have to be a deadhead to settle for this junk AND throttling. That little germ mascot is caught at you for a good reason. Wait, WHAT? A current subscriber to Cricket has to PAY a $25 (call it a penalty) to pop a SIM card in a different phone or PURCHASE an upgraded phone from them? Sounds like Att runs mvno's same way they lie & rip people off that get suckered into their dishonest satellite TV services. That 140 million "device" quote above ain't gonna sustain as more people leave satellite TV services & will find a new phone service as well. Swapping SIMs doesn't cost anything. The $25 upgrade fee (which applies to online as well as in-store purchases) is only charged when a current customer buys a new phone from Cricket. "(which applies to online as well as in-store purchases)"
OK Dennis. Update your Cricket review with these words. I just updated the Cricket Profile post with the current upgrade fee policy. Funny how T-Mobile gets constantly criticized for being too small to build a network good enough to compete with AT&T and Verizon yet it seems AT&T isn't big enough to build a network with the capacity the modern world needs. The result is the only carrier with two prepaid brands with speedcaps (Cricket and AT&T Prepaid) and the only carrier with a speedcapped postpaid plan. Not even broken Sprint speedcaps their plans. Cricket subscribers didn't really need a data increase. Their buckets, coverage and data speeds were already stellar. The only valuable plan here is the 5GB for $35 with autopay plan. For AT&T coverage its not bad. Correction to the post, the $55 Unlimited2 plan is eligible for the $5 auto-pay discount. Please correct me if I'm wrong. Looking at the Cricket website today I get the following impressions, the $10 hotspot add-on seems to be available on all plans, the 8mbps speed cap appears to be gone and so does the $5 autopay discount. I see no such thing. What Cricket URL are you looking at?